Feet up, enjoying a steaming hot cup of coffee whilst flicking through the paper ….. life doesn’t get much better than this ! Until that is we stumble across the very latest article on KC accommodations and their shortlisting for a highly acclaimed and sought after national property award. 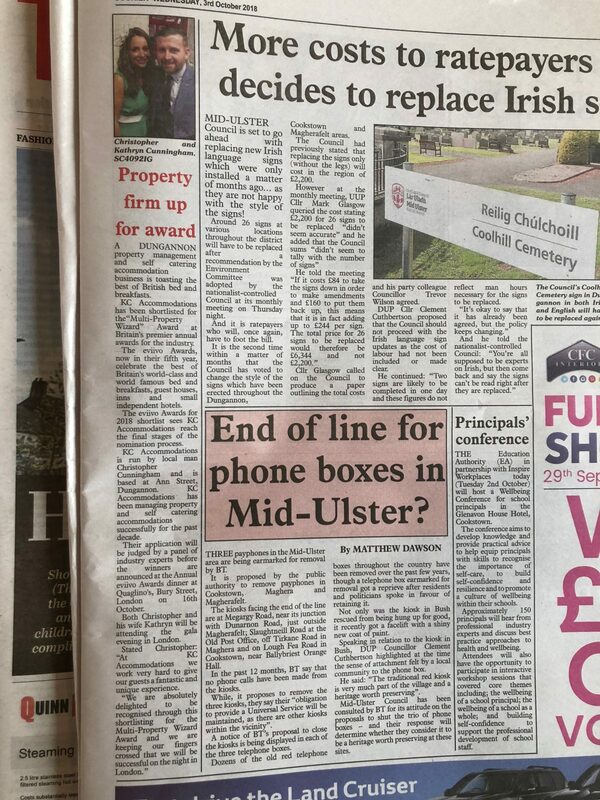 The Tyrone Courier Writes “ A Dungannon property management and self catering accommodation business is toasting the best of british bed and breakfasts. KC accommodations has been shortlisted for the Multi-Property Wizard Award at Britain’s premier annual awards for the industry. The application will be judged by a panel of industry experts before the winners are announced at the annual Eviivo Awards dinner in London on the 16th October. “At KC Accommodations we work very hard to make sure that all of our guests have a fantastic and unique experience. Here at KC Accommodations HQ we are simply proud as punch to see all his hard work recognised, be part of Chris’s vision, and will be waiting with baited breath on the 16th of October.